New RCA Nashville recording group Bush Hawg was on a two-week tour of Japan and Guam for Armed Forces Entertainment when the area was struck by last week’s record 9.0 magnitude earthquake. The six-man group, consisting of band members Jim Phipps, Russ Caldwell, Craig Hand, Shaun Ames, Alex Wilshire, and Ben Helton, are now safe in Guam. They were loading in for a performance at Yokota Air Base when the quake registered 5.0 at their base location, less than 30 miles from Tokyo. Temporarily stranded at Yokota, the band was able to assist in preparing barracks for relief workers. Bush Hawg has been sharing some of their experiences via their Facebook page. The group is currently recording its debut album with multi-Platinum producer Michael Knox, with a release slated for later this year. 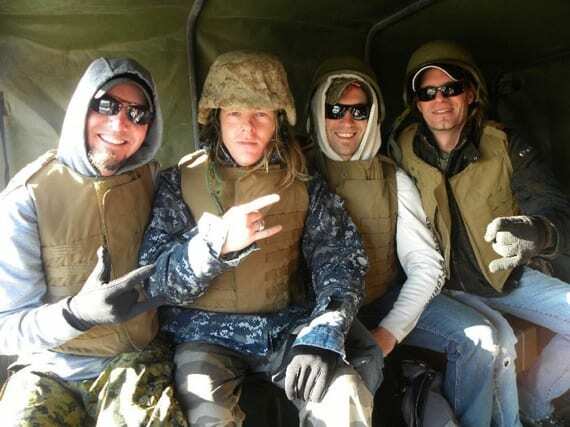 In this photo from earlier in their journey, several band members shared a ride in a Humvee. Pictured (l-r): Bush Hawg’s Shaun Ames, Craig Hand, Alex Wilshire, and Jim Phipps.